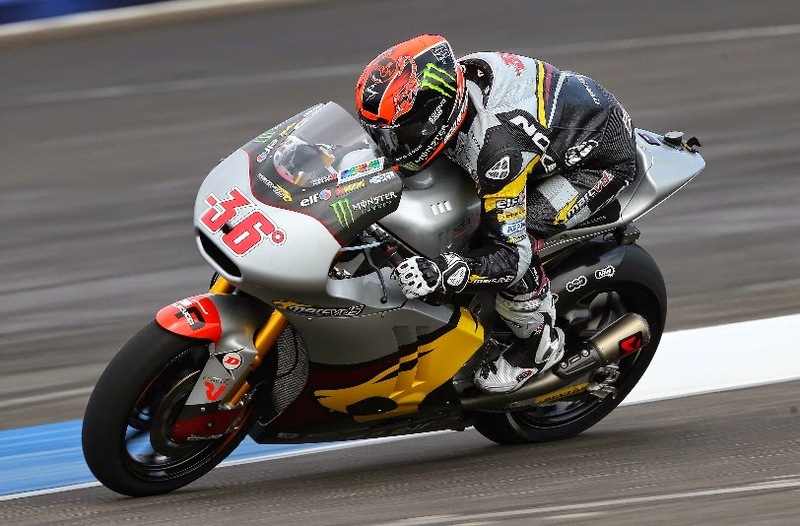 With the summer break well and truly over Moto3 got the qualifying action under way at the revised and resurfaced Indianapolis Motor Speedway. The Brickyard’s new layout allows for faster lap times so the record books have been re-written in all the classes with Jack Miller taking pole with a circuit best of 1m 40.727 in Moto3 for Red Bull KTM Ajo. The Championship leader has now been on pole three times in a row, the second time this season that the Australian rider has achieved this. Miller top time came early in the session, a move consciously made to avoid all the track traffic at the end of qualifying, while the Ajo bikes always left together to chase each other on clear track to give them the best possible chance for an assault on the timesheets. The Spanish Honda pair of SaxoPrint-RTG rider Efren Vazquez and Estrella Galicia rider Alex Marquez also made the front row in second and third respectively. Marquez was well ahead of his team-mate Alex Rins who found the going tough in 12th. A rare good qualifying from Romano Fenati saw the Sky Racing VR46 rider take fourth. Joining him on row two are Juanfran Guevara, who accelerated up the order via a tow from John McPhee, in fifth and Jorge Nararro who had an excellent debut qualifying for Marc VDS in sixth. McPhee finished the session seventh. Francesco Bagnaia and fellow Italian Alessandro Tonucci start eight and ninth, with CIP rider Tonucci the top Mahindra on the grid. Karel Hanika was also rewarded from the Ajo plan and starts tenth. Husqvarna’s Danny Kent was 17th. Moto2 took to the humid track last and after a few drops of rain briefly fell it was Marc VDS rider Mika Kallio who stamped his authority with his fourth lap of 1m 36.883 good enough to last the whole session for pole. The Finnish rider was the only person to put in a sub 1m 37 time as he remained untouchable. His team-mate Tito Rabat came closest but a early wobble on the Kalex was a warning and a fall in the closing stages meant a wait as he held on to second. Top Suter honours went to the bike in third – the Technomag carXpert machine belonging to Sachsenring victor Dominique Aegerter, who spent his break hitting the podium in the Suzuka 8 hours, where his team placed third. AirAsia Caterham’s Johann Zarco and NGM Forward Racing’s Simone Corsi both chipped away at their times as the clock ran down on the way to fourth and fifth on the grid. Top rookie Maverick Vinales sits in the final spot on row two in sixth position for Paginas Amarillas HP 40. A return to his successful settings from the beginning of the season saw Taka Nakagami back in the action, qualifying in seventh for Idemitsu Honda Team Asia. Sandro Cortese secured eighth before knocking into Lorenzo Baldassarri in a crash filled qualifying ahead of Interwetten’s Tom Luthi in ninth. Briton Sam Lowes improved from his strong run in practice to seal the final spot in the top ten for Speed up, Gino Rea also had one of his best qualifying performances of the season in 25th. For the full Moto3 results click hereand for Moto2 click here.